To that end, it also calls for robust action to target the most pressing criminal threats facing the EU. On 27 March 2017, the Council decided to continue the EU Policy Cycle for organised and serious international crime for the period 2018 - 2021. 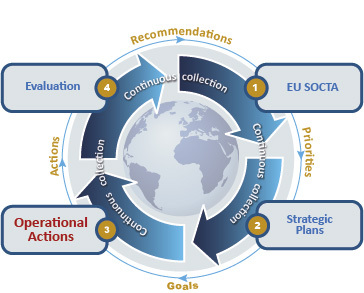 This multi-annual Policy Cycle aims to tackle the most important threats posed by organised and serious international crime to the EU in a coherent and methodological manner through improving and strengthening co-operation between the relevant services of the Member States, EU institutions and EU agencies as well as third countries and organisations, including the private sector where relevant. To fight cybercrime, by (1) disrupting the criminal activities related to attacks against information systems, particularly those following a Crime-as-a-Service business model and working as enablers for online crime, by (2) combating child sexual abuse and child sexual exploitation, including the production and dissemination of child abuse material, and by (3) targeting criminals involved in fraud and counterfeiting of non-cash means of payment, including large-scale payment card fraud (especially card-not-present fraud), emerging threats to other non-cash means of payment and enabling criminal activities. To (1) disrupt the activities of Organised Crime Groups (OCGs) involved in the wholesale trafficking of cannabis, cocaine and heroin to the EU, to (2) tackle the criminal networks involved in the trafficking and distribution of multiple types of drugs on EU markets and to (3) reduce the production of synthetic drugs and New Psychoactive Substances (NPS) in the EU and to dismantle OCGs involved in their production, trafficking and distribution. To disrupt OCGs who facilitate illegal immigration by providing facilitation services to irregular migrants along the main migratory routes crossing the external border of the EU and within the EU, particularly focussing on those whose methods endanger people’s lives, those offering their services online and making use of document fraud as part of their business model. To combat organised property crime by concentrating on disrupting highly mobile OCGs carrying out organised thefts and burglaries across the EU. This should include OCGs using new technologies or enhanced countermeasures which exploit the lacking interoperability of cross-border surveillance tools. To fight against the trafficking in human beings (THB) in the EU for all forms of exploitation, including sexual and labour exploitation as well as all forms of child trafficking. To disrupt the capacity of OCGs and specialists involved in excise fraud and Missing Trader Intra Community (MTIC) fraud. To disrupt OCGs involved in the illicit trafficking, distribution and use of firearms. To disrupt OCGs involved in environmental crime, more particularly wildlife and illicit waste trafficking. To combat criminal finances and money laundering and facilitate asset recovery in view of effectively confiscating the criminal profits of OCGs, especially targeting money laundering syndicates offering money laundering services to other OCGs and those OCGs making extensive use of emerging new payment methods to launder criminal proceeds. To combat document fraud in the EU, targeting OCGs involved in the production and provision of fraudulent and false documents to other criminals. EMPACT is an ad hoc management environment to develop activities in order to achieve pre-set goals. It is a structured multidisciplinary co-operation platform of the relevant Member States, EU institutions and agencies, as well as third countries, international organisations and other (public and private) partners to address the prioritised threats of organised and serious international crime. From the setting and pursuit of strategic priorities to the implementation of actions at an operational level, it ensures that major criminal threats are tackled with an intelligence-led approach. The SOCTA, developed by Europol, comprises a set of recommendations based on an in-depth analysis of the major crime threats facing the EU. On the basis of these, the Council of Justice and Home Affairs Ministers has defined its priorities for the first policy cycle, which runs from 2018 to 2021. The SOCTA plays a key role in the EMPACT policy cycle. In preparing the current SOCTA, Europol analysed trends and patterns in current crime data, but it also scanned the environment for other factors that can be expected, over the four years of the current policy cycle, to influence the commission of crimes and the ability of law enforcement to stop them. This provides the basis for its forecast of future threats to EU internal security. The analysis underpinning the development of priorities also supports the planning of operational actions. Europol has developed multi-annual strategic plans (MASPs) on the basis of the priorities defined in step 1 in order to define the strategic goals for combating each threat. The projects under EMPACT set out operational action plans (OAPs) to combat crime in the areas that have been assigned what is known as an EMPACT priority. An OAP is designated for each objective, and Member States and EU organisations work in a coordinated fashion to implement each OAP. Information on the OAPs comes to Europol via its secure system, SIENA, for analysis. The intelligence derived from these investigations informs reviews by the Standing Committee on Operational Cooperation on Internal Security (COSI) . The reviews are conducted on the basis, among other things, of Europol’s Serious and Organised Crime Threat Assessments (SOCTAs), which evaluate efforts to tackle crimes in the EMPACT priority areas. Based on its reviews, COSI may recommend adjustments within one and another area. Successes attributable in whole or in part to the EMPACT cycle have already been seen in each of the priority crime areas, and there is every reason to expect that this trend will continue.